Grassroots Oracle: Annual Oracle release cycle coming? 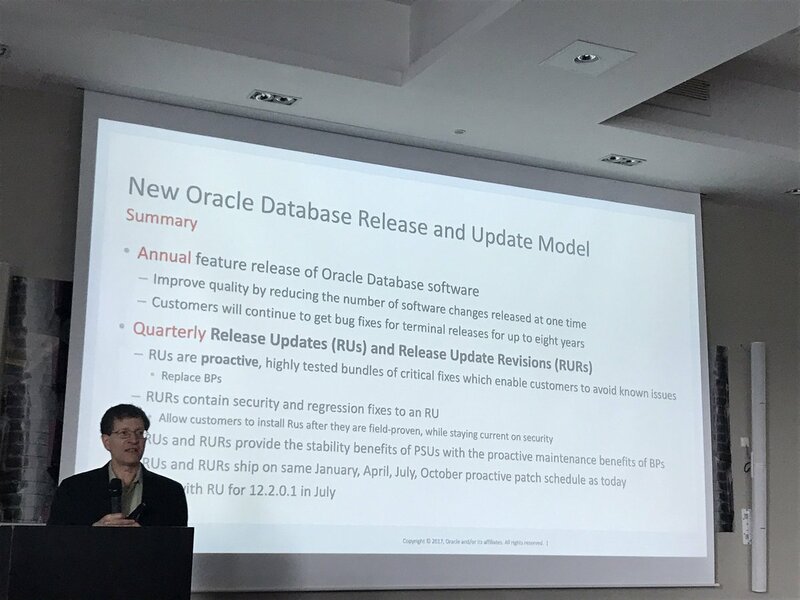 Annual Oracle release cycle coming? Those of you on Twitter at the end of May, and certainly those at DOAG might have seen this announcement. I'm no DBA, but that first sentence in the picture has the potential to be rather game changing. More information is to come (from official channels), as so eloquently put in a comment on this only other post I've encountered on the topic, but I've been pondering this glimpse of change with some colleagues, here in the suburbs of our isolated Australian city. We're navigating our way through a few upgrades now, and I've seen the same patterns before. Without a clear idea on event what month a major release may arrive, it can be difficult to engineer time into the schedule for an upgrade. It's like launching rockets, miss a window and you may have to wait months for another opportunity. Other software vendors have set release schedules, and it an annual release cycle will no doubt influence the operations of Oracle consumers (and conferences) around the world, I think for the better. And they probably won't need to worry about how to market the superstitiously tainted #13.